thx im kinda noob on pc things u think my pc is ok for play that game? I don't think you'll be able to run it at the highest settings, but you should be able to play it at a decent graphical quality. Please add exp and drop rates to your advertisement. @ogrefestorgPlease add exp and drop rates to your advertisement.Thanks. Hi! Rates are not really changeable in Black Desert Online because all data is being completed manually, by hand and there's really not knowing how much difference there is in official and here thus cannot be added to advertisement (confirmed by section rules). So it's the same as official then? Some values are official-"like" like workers etc, but we target to be slightly easier than official in some areas as experience and drops. All new patch notes may be found on our forums, regarding damage, world bosses etc. Hi, I have been playing on the OgreFest server for quite awhile now and I have a few things to say about that. For one I love the smaller community from Official its far easier to make friends on this server plus everyone is so nice, aside from your obvious outcast who do whatever but even they have a side to like. It being a private server in all it has its bugs but bugs are fixed daily and Nullbyte constantly adds new things to the server. You can keep track of what's added by reading the # patch-notes, # development - status, and # announcements channels in the discord. Some people keep spreading bad things about nullbyte but they are people who just come to the server to yell and complain about everything not being as easy as they want it to be. the goal of the server is not to make it so you have everything instantly, but to make everything easier than on official with no pay to win items ie. maids, value pack, ect. Aside with null the CMs are really nice and helpful and even play alongside the players so they get to experience what the players feel, This helps null figure out what to implement next. We wanted to inform you that our server is only trying to promote progress and competition. Our aim is to improve the quality of private servers and deliver to people who enjoy the game but can’t pay. Our services are free for everyone and always will be. Donations are for those who want to support our community. We are desperate as you said and stubborn. Desperate to evolve and offer our players the best experience possible, respecting and encouraging players to support the official servers too. Without them we wouldn’t be able to enjoy this great game. As I can understand you are only promoting hatred and toxic behavior to the community. Please be advised that we will always treat people with respect and love. Not like you. We put value on our players and they motivate us every day to improve the experience to the next level. So, I encourage all of you, including Loleta to come and be convinced that all I wrote is true. Thank you for the feedback! We are waiting you on OgreFest! 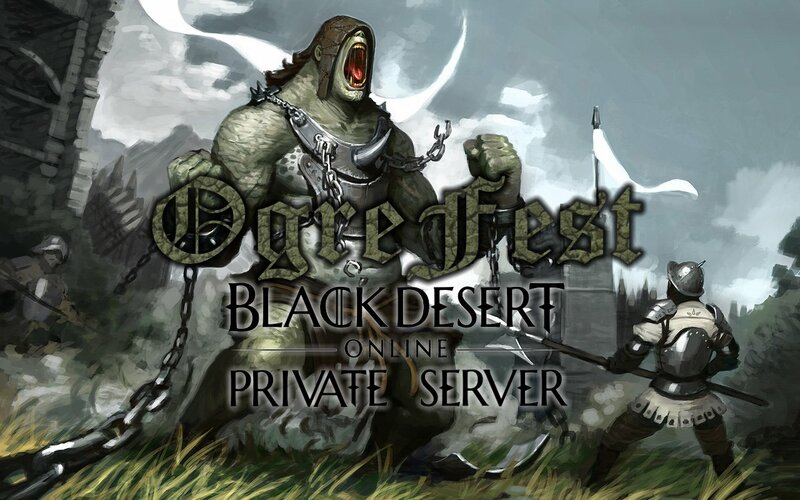 Dear players, we are pleased to announce that OgreFest is the longest lasting private BlackDesert server. Today we are making a year of existence. We started to work at our project for you and we tried to improve the gaming experience as much as we could so that our players will be as happy as they can and get the best experience possible on the server. We are and will remain free. We celebrate this event, this great year among you, we celebrate You! A lot has changed this last year, we improved the experience, we met new people, made new friends and laughed and fought as hard as we could. We maintained a safe and welcoming environment for all but some decided that they are better so they had to leave us. Well, we will protect fair gaming and that is an important point for us. There is always a place on our community for fair people that want to have fun and make more friends, create clans and enjoy. Lastly, in the honor of OgreFest, we are offering all players increasing the XP and drop rates for the weekend to thank you for your service. Without you all, there won’t be a server. Thank you all again for everything! good day, if i download the game in a computer and then i want to play it in another what files should i move, the entire folder ? and then download the launcher in the other pc ?